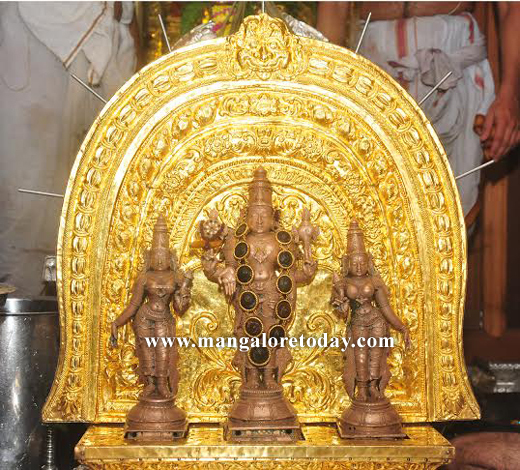 Mangaluru, Jan 26, 2015: A new Golden Prabhavali was dedicated to Lord Veera Venkatesha, the presiding deity of Sri Venkatramana Temple at Carstreet in Mangaluru on January 26, Monday on the occasion of the Car Festival. The Prabhavali is made using gold weighing one kg. Adige Balakrishna Shenoy, Jayaraj Pai, Padmanabha Pai, Temple Trustees and a large number of devotees were present.